Once physicians starts doing regenerative medicine or alternative medicine, they never go back to regular allopathic medicine. As I have recently studied for my recertifying exam in Physical Medicine and Rehabilitation, I was struck as to how many conditions Prolotherapy can cure where traditional treatments fail. While exercise, manipulation, manual therapies, and physiotherapy, as well as corticosteroid shots and surgery have their place, the whole field of pain medicine would be altered drastically if Prolotherapy would gain its rightful place in the treatment of joint instabilities, tendinosis, and the whole gamut of non-healing degenerative joint and soft tissue conditions. Fortunately for all of us, the field of Prolotherapy is filled with many innovators that are continually pushing Prolotherapy forward and showing us all that the body has tremendous regenerative capabilities. The next two issues of the Journal of Prolotherapy will be filled with the techniques and stories from these brave, skilled, and innovative clinicians. A good friend of mine Gerardo Cajero Callejas, MD, who was one of the first doctors in Mexico doing Prolotherapy, sent the Journal of Prolotherapy some of his results from the headache patients he has treated at his clinic. (See Figure 1.) Because of his work, and that of other doctors, including Jose Eleazar Calderon, MD, Prolotherapy is gaining momentum in Mexico. Dr. Calderon combines traditional Hackett-Hemwall Prolotherapy with ozone therapy to enhance healing. In this issue, to educate us all on this technique, Frank Shallenberger, MD, the main proponent of using ozone in regenerative injection therapy, wrote an article on what he termed Prolozone™. Dr. Shallenberger also teaches courses on Prolozone™ for anyone wanting to learn the technique. Figure 1. Results from headache patients treated by Gerardo Cajero Callejas, MD, at his clinic in Mexico. The nine patients I am presenting suffered from chronic headaches that spanned from mild to severe pain. The patients had previously been treated with several methods, including manipulation, braces, physiotherapy, NSAIDs, and other migraine drugs. All of the patients were injected in occipital and cervical regions and received between one and 10 treatments, given every six weeks. Each were injected with a Prolotherapy solution consisting of 15% dextrose and 2 % lidocaine, using 22G, 3-inch needles. Thirty injections were given at each treatment. We prescribed them a paracetamol-like analgesic and didn’t recommend excessive rest. They continued their normal activities, then started an exercise regimen after the second treatment. None of the patients used a neck brace. Prolotherapy has demonstrated a 85% to 90% success rate in my private practice. Furthermore, Prolotherapy has prevented the patients from requiring expensive medical treatments and unnecessary surgeries. Only one patient was not satisfied with the results of the treatment because the pain only improved by 50% and she needed to continue to take some pain medications. The rest of the patients were satisfied with the results. Some of them came back to my office for pain problems in others areas of their bodies, which were also treated with Prolotherapy. As most of us are aware, it appears that this decade is fast becoming the decade of stem cell therapy. To introduce the topic, we have included an article by someone who is doing innovative work in this field, Harry Adelson, ND. He describes the technique he is using, direct bone marrow injections, for conditions such as degenerative osteoarthritis. Another exciting area of innovation for Prolotherapy is the work of New Zealand physician, Dr. John Lyftogt. His technique has several names including Neurofascial Prolotherapy, Neural Prolotherapy or Subcutaneous Prolotherapy, and involves the injection of 5% dextrose around the subcutaneous nerves with the purpose to promote regeneration, repair, or other functional restoration in subcutaneous nerves. His treatment helps decrease neurogenic inflammation in the small nerves that can be the source of chronic pain. He has published some impressive results on the therapy.1-3 One of the doctors who practices this technique, Adam Weglein, DO, shares his knowledge on how to incorporate this technique into a Prolotherapy practice. Wow, what an issue! We are also fortunate this month to have Richard DonTigny, physical therapist, give us his insight into the sacroiliac joint in the second part of his two-part series. Mr. DonTigny, first published his findings in 1962. His method of analysis and treatment of the sacroiliac joint, in physical therapy circles, is known as The DonTigny Method™. At the age of 79, we are grateful that he continues to share his knowledge on the sacroiliac joint.Yes, Mr. DonTigny, we agree the sacroiliac joint moves! Another passionate Natural Medicine advocate, Karina Gordin, has submitted her Case for Prolotherapy which takes a look into the hypocrisy of what treatments are typically covered by insurance in traditional pain management, while Prolotherapy is often not covered. Thank you Karina, for your contribution and support of Prolotherapy and Natural Medicine! Babette Galdstein, VMD continues to expand the veterinary literature on the use of Prolotherapy in animals with her case studies. To reiterate this point, for the work of Prolotherapy to become established in human medicine, it is extremely helpful to show its efficacy in animals. It is believed that placebos don’t have an effect on animals.4 Thus, if Prolotherapy works for degenerative arthritis and other conditions in animals, this gives credence to the notion that Prolotherapy regenerates injured structures. As with all innovation, time will tell if the various procedures work long term or not. What will be the place in chronic pain management for techniques such as Hackett-Hemwall Dextrose Prolotherapy, Bone Marrow Prolotherapy, Stem Cell Prolotherapy, Prolozone™, PRP Prolotherapy, or Neural Prolotherapy? Whatever the place, we agree that the more we publish and the better the studies that are published, the easier this question will be answered. Dr. Gary Clark gives us his insight and recommendations for those desiring to publish their Prolotherapy results in Part III of his four part evidence-based medicine series. Lastly, I have co-authored a research paper with Hilary Philips on Joint Hypermobility Syndrome and Ehlers-Danlos Syndrome. These are very painful conditions, with a lack of successful traditional treatment options. In my experience, Prolotherapy is a highly effective treatment for these conditions. Even considering these multiple joint cases, the patient cost is a fraction of surgical costs and can help patients lead active, fulfilling lives. I can only think that as we continue to document the results of Prolotherapy by good patient questionnaires, and of course, objective measures such as physical examination parameters, MRI, and ultrasound scans, that some day the vast expanse of pain management will look a lot different than it does today. Anyone involved with orthopaedic medicine and Prolotherapy in the United States will be familiar with the names John Merriman and Donald Fraser. Both were true pioneers and we owe them a great debt. 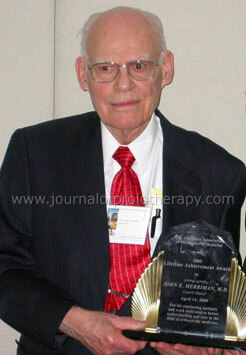 Dr. John Edward Merriman was awarded a lifetime achievement award by the American Academy of Orthopedic Medicine in 2005. Dr. Merriman, always an innovator, established the first cardiac rehabilitation program in North America at the University of Saskatchewan in 1962. He was a cardiologist by training and a Professor of Medicine at the university. In 1975, he moved to Tulsa, Okalahoma to establish a medical practice. At a Christian medical conference he met Dr. Gustav Hemwall and became interested in Prolotherapy. Dr. Merriman went on many missionary trips with Dr. Hemwall and other doctors utilizing Prolotherapy. He was a beloved man. I had the pleasure of working with him at a medical missionary clinic in rural Illinois. He led an amazing life. He was devoted to God, his family and his work as a physician and a researcher in Prolotherapy. He spent the last 20 years of his life doing Prolotherapy at his Tulsa, Oklahoma office. He retired in 2010 at the age of 85. He passed away peacefully with his wife and children by his side on February 7, 2011. The term orthopaedic medicine in North America is synonymous with Dr. Donald M. Frasier. 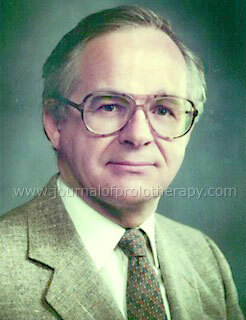 A gifted physician, scholar, and teacher, he practiced Family Medicine in St. Catharines, Ontario from 1953-1982. In 1983, he devoted his energy and expertise to orthopaedic medicine, for which he was internationally known and respected. He continued to see patients for 28 years, right up until he died on December 18th, 2010. It is difficult to adequately include how Dr. Fraser helped shape, promote, and further the cause of orthopaedic medicine in the United States and Canada. He was a charter member of the American Association of Orthopaedic Medicine, served on its Board of Directors, and received the 2001 Lifetime Achievement Award for his continuing work in this field of medicine. He was personally trained by Dr. James Cyriax and became a Fellow in the Society of Orthopaedic Medicine. He was a mentor to many physicians who subsequently became leaders in the field of Orthopaedic Medicine. We are grateful to these two pioneers who helped get orthopaedic medicine and Prolotherapy established in North America. We at JOP are committed to carrying on their work and message. Lyftogt J. Prolotherapy for recalcitrant lumbago. Australian Musculoskeletal Medicine. 2008;13:18-20. Lyftogt J. Subcutaneous Prolotherapy for Achilles tendinopathy. Australian Musculoskeletal Medicine. 2007;12:107-109. Lyftogt J. Subcutaneous Prolotherapy for refractory knee, shoulder and lateral elbow pain. Australian Musculoskeletal Medicine. 2007;12:110-112. McMillan FD. The placebo effect in animals. Journal of the American Veterinarian Medical Association.1999;215:992-999.